Did Warren Buffet Really Risk A Billion Dollars? The biggest winner, though, is Warren Buffett. None of the entries in Quicken Loans’s Billion Dollar Bracket Challenge made it through the weekend unscathed. This means that Buffett will not have to pay up on the insurance policy Quicken bought from Berkshire Hathaway. There was never much of a chance Buffett would have to pay up, of course. Quicken actually did make it a bit easier than expected by not making people pick winners of the play-in games. Tennessee/Iowa, for example, was one “team” for the purposes of picking winners. If you flipped a coin to determine your picks, the odds of a perfect bracket would be more than 1 in 9 quintillion (a quintillion is a million billions). However, a knowledgeable picker (someone who doesn’t pick a 16 seed over a 1, for example) can likely cut those odds to around 1 in 128 billion, according to DePaul University math profession Paul Bergen. Even if you beat those incredible odds, you wouldn’t actually get a billion dollars. You would get $25 million per year for the next 40 years, or a $500 million lump sum. Half the value is already gone, and the tax man hasn’t visited yet. Buffett also told ESPN’s Rick Reilly that if someone had a perfect bracket within only one game remaining, he’d attempt to buy out that person for $100 million. In theory, that person would have a 50% chance of winning a $500 million lump sum, so their expected result would be $250 million. However, it’s an all or none situation. If you’re living paycheck to paycheck, would you rather have $100 million guaranteed, or a 50% chance at $500 million (plus a 50% chance of $0)? I’d take the $100 million. In fact, I’d take any amount that would allow me to quit my job and maintain my current quality of life until I die. I don’t need to be fabulously wealthy – I’d happily settle for a life of leisure. Sleeping in a bit in the morning, writing fiction until the kids come home from school every day, traveling a bit more – that would be just fine with me. So the likely worst case scenario for Buffett would be coughing up $100 million. Realistically, he could probably cut this down to $10-20 million and still get a lot of people to take the offer. For many people, the difference between broken and $10 million is less than the difference from $10 million to $500 million. There’s a point in this. Sometimes it makes sense to lock in a positive result rather than risking it all for a better result. Financial decisions should be made with your head and not your heart (or your greed organ). The Decoy Effect: Is Your Brain Messed Up Like Mine? I’ve always known that I think a little differently than most people. My brain craves math. It needs math. If necessary it will make something mathematical that really doesn’t need it. The result is that I’ve laughed off behavioral finance for the most part. I tend to ignore the experts that say people spend more money with credit cards because they don’t feel the pinch of losing real money. While I know it is statistically true, and hence I shouldn’t ignore it, my mind says, “Money is money.” I would think credit cards would keep spending in-check, because you can get a report at the end of the month of where your money went. You spend cash and there’s no “paying the piper” later on. Last week, I was watching an episode of Mind Games on ABC. I’m thought it would be interesting and fill the hole in my nerdy self that was left when Numbers went off the air. The premise of the show is that a group of smart people use psychology to help people achieve their goals. That description made it sound like the world’s least interesting show, but it wouldn’t make ABC’s PrimeTime line-up if it was that bad. The thought process is, I save a lot of money and give up a little storage… this seems to be the better bargain. 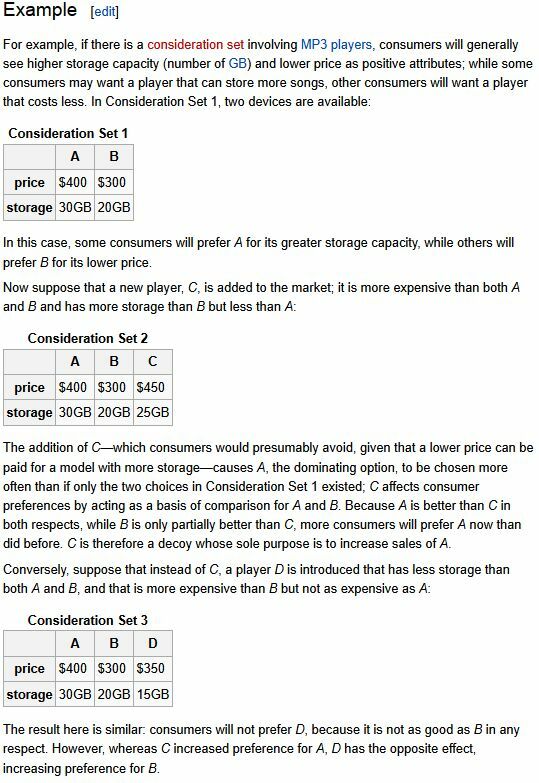 And when the decoy is added in Consideration Set 3, I’m supposed to prefer Product B to Product A. However, I now prefer Product A. The thinking is similar, “I can get 100% more storage for just $50.” Clearly that’s the better bargain, right? I don’t have as strong as a preference as I did in Consideration Set 2, but that’s probably because I’m more inclined to be frugal and take the $300 option funneling the $100 savings towards another technology gadget. I don’t know what this all means. I wish I had some grand conclusion. I will settle with sharing an interesting marketing phenomenon and a little insight into how my frugal mind thinks.